A plastic-free food-grade stainless steel container. 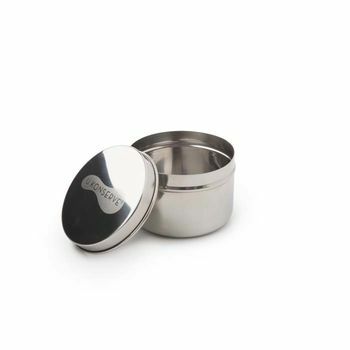 This smart and sturdy stainless steel container is made from #304 (18/8) food-grade stainless steel and is perfect for taking berries, nuts, hummous or crackers into work or out on a picnic. 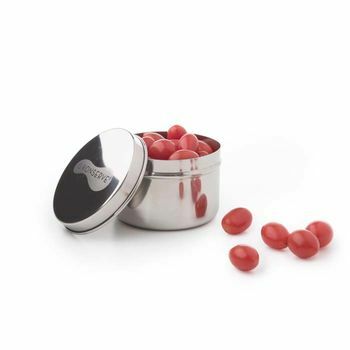 It comes with a stainless steel lid so is also perfect for those who prefer to use plastic-free products. Not recommended for liquids such as salad dressings due to possible leakage. Approximate size: 5cm tall x 7.5cm diameter. Capacity: 6oz/170ml.